Since WFMT critic-at-large (and Chicago Sun-Times music critic) Andrew Patner's sudden death on February 3, a number of people have confessed that they not only admired him, but actually wanted to be him—the irrepressible, erudite man-about-town with a seat at every table and a world of friends. They all realize that's impossible. Patner was nothing if not idiosyncratic. On Wednesday night at Orchestra Hall he got a send-off that's also unlikely to be equaled. More than 800 people filled the main floor and box seats for a celebration of his life that included superb performances by the CSO Brass, a string sextet featuring members of the CSO and Lyric Opera Orchestra, jazz pianist Willie Pickens, and, from Lyric Opera, baritone Will Liverman, accompanied by Craig Terry. The closer was a video of the Floaters' superslick 1977 soul tune "Float On." Among the speakers were Patner's brothers, Josh and Seth, and school buddies like Rabbi Andy Bachman and jazz pianist Bethany Pickens (who also performed). 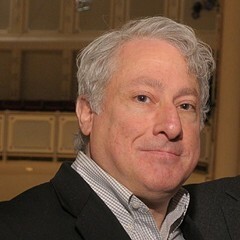 WFMT general manager Steve Robinson introduced the station's first Andrew Patner WFMT Fellowship Program intern (U. of C. student Hannah Edgar), and Lyric Opera general director Anthony Freud said Patner's regular aisle seat in the opera house will be sporting a commemorative plaque. 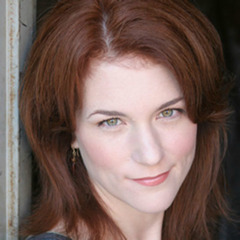 Laura Emerick, Patner's former editor at the Sun-Times, noted that he could also handle art, architecture, film, theater, dance, and literature. Philanthropist Fred Eychaner, one of many who mentioned that Patner's cultural chops coexisted with an active—even confrontational—passion for social justice, said he "will always be with us, asking 'Which side are you on?'" CSO violist Max Raimi (before launching into a moving Mozart duo with violinist Rong-Yan Tang) observed that Patner's reviews, instead of being off-putting, "drew people into our world." 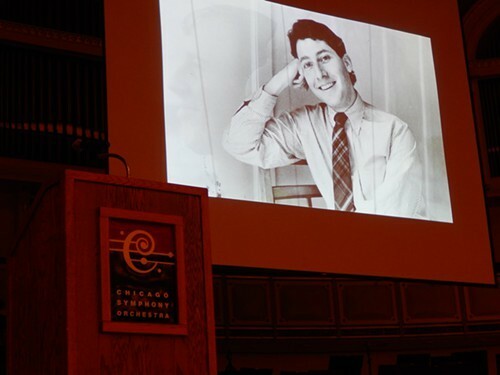 He was "the greatest friend musicians of the Chicago Symphony Orchestra ever had or ever are likely to have," Raimi said. Music critic Alex Ross, who exchanged 20,000 emails with Patner in the last decade, admired his candor, his expertise (particularly on everything Chicago), and the role he played for so many as listener and counselor. "Andrew was integral to my working process," Ross said. "I owe him a debt I could never repay." Patner's partner, New Yorker illustrator Tom Bachtell, whose portrait of Patner on the cover of the program will make it a keepsake, noted that he was "hard on shoes" and incorrigibly late: "someone is always waiting for Andrew somewhere." But, "when I heard the key in the lock I would know, the moveable feast has arrived, my very own Grand Central Station." There was a lot of love. All this sounds like hyperbole, but wasn't. If, somehow, Patner were still alive, I, who barely knew him, could count on an e-mail about this post. He was a hawk-eyed postpub copyeditor but, more than that, a generous reader. The best parts of this altogether unforgettable evening were the moments when snippets of Patner's WFMT broadcasts were played. The empty dome over the Orchestra Hall stage filled with that distinctive voice—friendly, funny, and (as Raimi described him) deceptively unassuming—introducing Riccardo Muti or Studs Terkel (whom he adored), or interviewing Takemitsu's barber. And then there was the familiar sign off, too final this time: "I'm Andrew Patner."